So, it’s time to take action – or not – on all that car maintenance you should have done before the hot weather and those long weekends, road trips and vacation. We could have just provided some sensible advice, but there’s always someone who won’t listen to that. 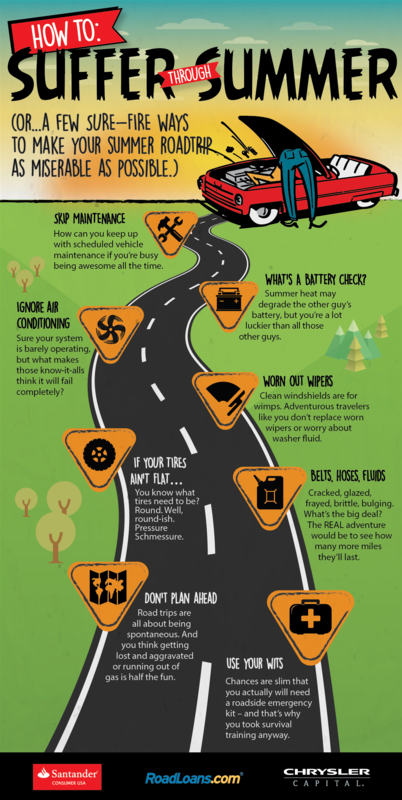 So, in the infographic below, we imagine what it would mean if you didn’t take care of that maintenance because you just don’t have the time, or, hey, the car’s running just fine now so why look for trouble. Make no mistake, the following “advice” definitely did not come from AAA nor would we recommend it. Remember, you may not be the only one to suffer the consequences if you travel the road below. Because these are sure-fire ways to make your family outings almost unbearable.